PODCASTS OF THE LABORATORIES ARE EMBEDDED IN THIS PAGE AND CAN ALSO BE FOUND IN THE VIMEO CHANNEL "M2 NEUROPATHOLOGY LABORATORIES"
The M2 Neuropathology Labs are exercises (quizzes) based on the material that is presented in the lectures. They are structured as matching multiple choice questions, in which the student is asked to match clinical descriptions to pathological images. Each quiz has 5 options, A, B, C, D, and E, and 5 numbered images. The options are diagnoses, clinical clues, or brief histories. Some quizzes use gross pathology images and others microscopic. 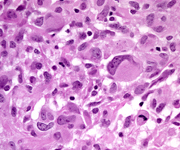 The images illustrate key aspects of pathology. 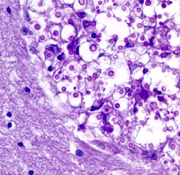 Unlike the images in “Neuropathology”, they cannot be magnified by clicking, but show enough detail to do the labs online. There are 15 quizzes, organized in 3 groups (labs), 5 in each lab. For the most part, the subject matter in the quizzes follows the topics that are presented in the lectures. Some topics from the first and second lab may reappear in subsequent labs. A series of video podcasts (one for each quiz) containing descriptions of the images, commentary, and the correct answers can be found in the Vimeo channel: M2 Neuropathology Laboratories . The podcasts can be viewed with iTunes or QuickTime. Reading material from the web site Neuropathology, lecture notes, and other resources will give you all you need to work through the labs. It helps to work with someone else or in a small group. An answer sheet is posted here but I recommend that you go to M2 Neuropathology Laboratories for a discussion of the quizzes. A. History of “migraine” headaches and seizures for many years. Recent severe headache and hemorrhagic CSF. B. Patient with longstanding diabetes and hypertension. 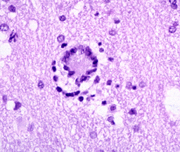 C. 33-year-old patient with fever, confusion, bizarre behavior, seizures and a CSF with 120 cells (81% lymphs), and normal protein and glucose. 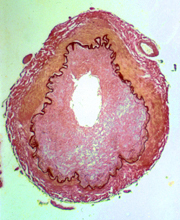 D. Hemiparesis, ten days after myocardial infarction. E. 45-year-old male cocaine addict with a history of hypertension; sudden collapse into deep coma; pinpoint pupils and decerebrate posturing. A. 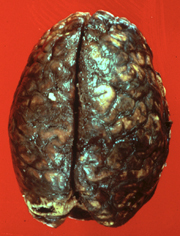 60-year-old alcoholic man with headache, meningismus, fever, and CSF with 800 polys/cumm. B. 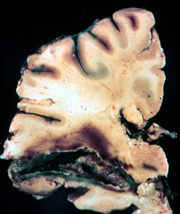 60-year-old nursing home patient with a long history of remitting and exacerbating neurological deficits and dementia. C. Severe neurologic deficit; no life threatening cerebral edema. E. Sudden onset of headache, hemiparesis and coma. Blood pressure of 220/115. Read the following case histories, A through E(one minute per case). Write your diagnoses below. Match the lettered case histories to the numbered images 16-20. Total time: 12 minutes. An 80-year-old man was admitted to the hospital unresponsive and febrile. Several years earlier, he had been diagnosed as having an “organic brain syndrome” and he had also sustained a subdural hematoma. The past several days, family members noted that he was becoming increasingly lethargic and did not eat or drink. On admission, the patient had purulent material in the pharynx. His neck was stiff. There was a pleural rub on the left. 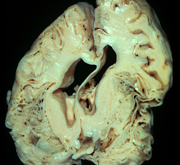 Brain MRI showed mild dilatation of the ventricles. A CSF was cloudy with 300 WBC (96% polys, 4% lymphocytes). Protein was 1080 mg/dl and glucose was 2 mg/dl. Gram stains revealed gram-positive diplococci. Blood cultures grew pneumococcus. Treatment with ampicillin and gentamicin was started. The patient remained unresponsive and had a cardiorespiratory arrest one day after admission. A 56-year-old woman was admitted to the hospital with fever, aching, dizziness and disorientation. She was an insulin dependent diabetic and had a history of hypertension. One month earlier, she had the left adrenal gland removed for an adenoma that had caused Cushing’s syndrome. She was receiving replacement corticosteroids. Mental status deteriorated and she became comatose and had intractable seizures. CSF, on admission, had 17 cells, all lymphocytes, protein 53 mg/dl and glucose 77 mg/dl. CSF cultures were negative. Urine cultures grew Candida albicans. Blood cultures were negative. Initially, brain MRI was normal. 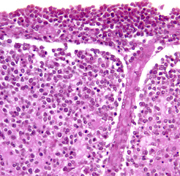 Later, it revealed diffuse encephalomalacia. also had diarrhea due to cryptosporidiosis. Helper T-cells were diminished to undetectable levels. He was discharged on Bactrim, Flagyl and antibiotics. Six weeks later, he developed headache, obtundation and seizures. CSF had 11 WBC’s, all lymphocytes, protein 137 mg/dl and glucose 26 mg/dl. Cryptococcal antigen was positive. A 9-year-old boy with severe combined immunodeficiency was admitted because of productive cough and dyspnea. He had had a variety of infections, starting shortly after birth, and had developed multiorgan dysfunction. He had chorioretinitis when he was 5 years old and was blind. Concurrent with the recent onset of cough, he had become lethargic and did not seem to recognize his Braille letters. While in the hospital, he developed fever, pneumonitis, cellulitis of the left foot, and had episodes of stiffening (?seizures), aspiration and hypotension. He gradually became comatose and died 15 days after admission. A brother had died at 2 ½ years of age from complications of SCID. A newborn girl, who was born at 36 weeks, did well at home for 12 days and then developed fever (38.6 C), lethargy, and seizures. She was admitted to the hospital and was treated with phenobarbital with good seizure control. Fever and lethargy continued and, a head CT, 7 days after admission, revealed diffuse hypodensity. Two days later, her sutures split. CSF was xanthochromic with 36,000 RBCs, 199 WBCs (98% lymphocytes), protein 1330, and glucose 16. She became comatose and died 4 days later. Read the following case histories, A through E. Write your diagnoses below. Match the lettered case histories with the numbered images 21-25. An 89-year-old woman became progressively less active two weeks prior to her admission and was found unresponsive in bed on the day of admission. Her past medical history was unremarkable. On admission, she had a temperature of 39C, her neck was rigid and she had left facial droop. Head CT was normal. CSF was slightly cloudy with glucose 42 mg dl, protein 346 mg dl, and 345 white blood cells (4% polys, 95% lymphocytes). 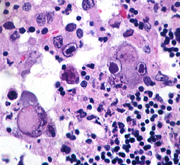 Gram stains and cytologic examination were negative. Treatment with ampicillin was started. The patient continued to be obtunded and chest x-rays, five days after admission, showed an infiltrate in the right lower lobe and pleural effusion. 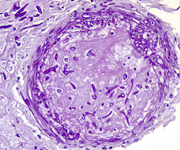 Bronchial aspirate was positive for Mycobacterium Tuberculosis. Treatment with antituberculosis medications was started. Over the ensuing 10 days, left hemiparesis and seizures developed, and the patient gradually lapsed into a coma. She became progressively dyspneic and hypothermic and died 23 days after admission. An 18-year-old man who had just returned from the Mardi Gras celebration in New Orleans developed a sore throat, fever, headache, nausea and vomiting. He became confused, and two days after the onset of symptoms, his mother found him sitting up, drooling and staring straight ahead. He did not respond to her. En route to the hospital, he had a seizure. A CSF was clear with 200 WBC’s (93% polys), glucose 90 mg/dl and protein 91 mg/dl. Cultures were negative. He became agitated and unresponsive. Seizures continued. Brain MRI revealed hypodensity with enhancement in frontal and temporal lobes. A repeat spinal tap contained 350 cells, all lymphocytes. He was treated with Acyclovir and Decadron, but deteriorated further and died two weeks after admission. A 35-year-old LPN was admitted to the hospital with fever, confusion and severe headache. 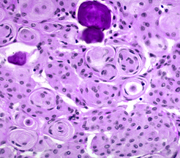 CSF was xanthochromic with 1,051 WBC (98% neutrophils). Culture grew Neisseria Meningitidis. She was treated with antibiotics. She had seizures and confusion for one week. She was discharged 27 days after admission. Six days after discharge, she developed lethargy, seizures, and left hemiparesis. She died of a massive right hemispheric infarct. A 31-year-old man with AIDS was admitted to the hospital for neurological evaluation. He had been on AZT for two years, but had been taking the medication erratically. Two months before admission, he developed hand tremors. Then he became progressively forgetful and weak. Left leg weakness and foot drop appeared three weeks before admission. His gait became ataxic, and his speech was slow and slurred. He was disoriented. There was no evidence of systemic infection. Brain MRI revealed mild bilateral diffuse white matter hypodensity. CSF showed 4 lymphocytes and normal protein and glucose. A brain biopsy was done. A 26-year-old woman had weakness of the right leg, then of the left leg, and numbness of the hands and perioral area. She recovered without treatment but, three years later, she suddenly developed paraplegia, blindness and aphasia. She made a good recovery and was able to function for the next 9 years, except for slight residual weakness. Then, paraplegia recurred with spasms of the legs. She also suffered left facial paralysis and nystagmus. CSF showed 25 WBC’s, all lymphs, and normal protein and glucose. Tendon reflexes were brisk, and plantar responses were extensor. Subsequently she became incontinent. From that point on, her condition remained unchanged. She became demented, had frequent urinary tract infections and died of pneumonia at age 47. Match the lettered case histories/descriptions with the numbered images 26-30. B. 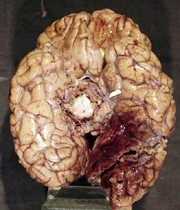 The most common primary malignant brain tumor in adults. 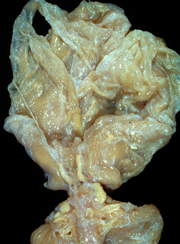 C. Benign supratentorial extra-axial tumor. D. Patient with unilateral hearing loss. 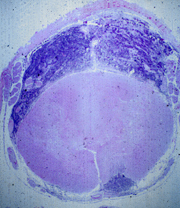 E. Bitemporal hemianopsia and Cushingoid features. A. 28-year-old trauma victim with a left subdural hematoma. After admission, patient developed a nonreactive, dilated left pupil. B. Collapse and death moments after performance of a lumbar puncture in a patient with hydrocephalus. C. 16-year-old gang member, deposited at emergency room dead. Examination revealed bitemporal skull defects and gross scalp hemorrhage. D. Patient with alcoholic liver disease who fell, coming out of a bar, and hit his occiput. E. 3 month-old baby admitted for lethargy following accidental fall. Radiograms reveal rib fractures of varying ages. 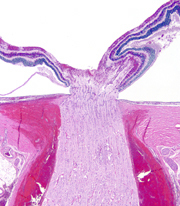 #33 is a longitudinal section of portion of the optic nerve and posterior part of the eye. A. Motor vehicle accident victim, unrestrained, without identifiable skull fracture. B. 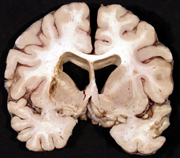 Patient with left parietal GBM, temporal lobe herniation, and right homonymous hemianopsia. C. Patient with severe headache. Arteriography reveals a ruptured MCA aneurysm. D. Alcoholic patient with a history of fall and left subdural hematoma. 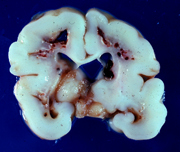 E. 6 year-old boy with acute lead poisoning, severe cerebral edema, and cerebellar tonsillar herniation. Read case histories A through E. Write your diagnoses below. Match the case histories with images 41-45. A 70-year-old man had a sudden onset of slurring of speech and right arm weakness which resolved in 30 minutes. However, right hemiparesis, facial paralysis, and slurred speech reappeared insidiously within a few days and progressed. MRI revealed an enhancing mass involving the left frontal lobe, basal ganglia, and internal capsule. The patient had AIDS which he had presumably acquired from a blood transfusion several years earlier, in the course of partial gastrectomy for peptic ulcer. A 50-year-old man had seizures in the left hand for several years. Then weakness of the hand and arm developed, followed by a drop of the left side of the mouth. Seizures became more frequent and headaches appeared. Brain MRI revealed a right parasagittal extra-axial mass which was totally resected, leading to complete recovery. A 74-year-old woman who had a right parietal headache for one month developed weakness and numbness of the left hand and began to drop things. The whole left arm then became weak, and drooping of the left side of the mouth developed, along with a sensation of thick tongue. Weakness progressed to involve her left leg, and a defect in the left visual field appeared. MRI revealed an enhancing right parietal mass. A craniotomy was done, and a necrotic tumor was partially resected. A 3 year-old girl had a cerebellar tumor which was partially resected. She received intrathecal chemotherapy and craniospinal irradiation and was stable for ten months. Then, she developed tingling of the toes, back pain, and weakness in the legs. 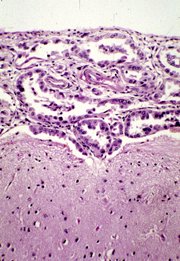 A lumbar puncture revealed tumor cells in the CSF. Symptoms progressed, and within three months she lost sensation below the chest, and became paraplegic and incontinent. Additional chemotherapy and irradiation was given, but she died four months later. A 62-year-old woman who had had mastectomy for breast cancer two years earlier gradually became confused, ataxic, weak, and dysarthric. Head CT was normal. CSF was clear with protein 136 mg/dl, glucose 14 mg/dl, and 30 lymphocytes. Her condition worsened, and a succession of cranial nerve deficits appeared. She deteriorated further, became comatose, and died 2 ½ months after the onset of the neurological symptoms. Match your diagnoses with images 46-50. A 7 year old boy was an unrestrained passenger in the front seat when the car in which he was riding was hit by another car on the left side. The air bag deployed, hitting him in the left temple. In the ER, he was unconscious, responding only to painful stimuli by extensor spasms. He had a scalp laceration and fractures of the skull and left jaw. One week after the accident, he was still unconscious. His pupils and eye movements were normal, corneal and gag reflexes were present, and he had no facial weakness. He had weakness, spasticity and brisk tendon reflexes on the right. Both plantar responses were extensor. He lay most of the time with eyes open and had coordinated eye movements following sounds and moving objects. He appeared to sleep at times but could be roused. He died of pneumonia and sepsis 10 days after the accident. A 4 year old boy had headaches and frequent vomiting in the morning for 2 weeks. Examination by a pediatrician and gastroenterology referral revealed no abnormalities. The symptoms worsened. He became incoordinated and his vision became blurred. Fundoscopic exam revealed papilledema. MRI showed a cystic cerebellar mass. A posterior fossa craniotomy was done and a partly cystic lesion was removed. A 39-year-old woman with Hodgkin’s disease developed a rapid succession of neurologic deficits. First, there was left facial weakness, followed by ataxia and weakness of the left hand. One month later, a left visual field cut appeared, then left hemiparesis. CSF was normal. MRI showed areas of demyelination without mass effect. Two months later, right hemiparesis and upward gaze paralysis appeared. Gradually she became comatose and died four months after the onset of her illness. A 14 year old boy had buzzing in the left ear and tingling and pain in the left face for one year. Loss of hearing and vetigo gradually developed. Neurological examination revealed weakness and sensory loss on the left face. MRI revealed a 2.5 cm extra-axial mass in the left cerebellopontine angle, extending into the left auditory meatus. His mother had a spinal cord tumor removed when she was 34 years old. The tumor was removed entirely through a posterior fossa craniotomy. A 61 year old man had a history of focal seizures involving the left arm for 4 years. Gradually, weakness and spasticity of the left arm and face developed. Imaging studies reveiled an isodense poorly defined, nonenhancing mass in the right posterior frontal area, above the Sylvian fissure. 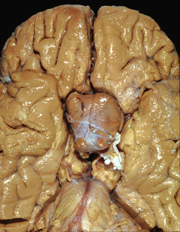 The lesion involved cortex and white matter. Fine calcification was noted on the CT. A biopsy was done. A. 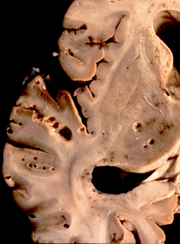 53 year-old man with a 1 year history of choreoatherosis, personality change, and dementia. B. 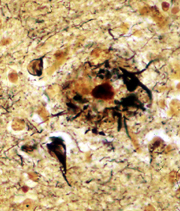 67 year-old patient with recent onset of dementia, incontinence, and abnormal gait. C. 47 year-old woman with remitting and exacerbating multifocal neurological deficits for 6 years. D. 79 year-old patient with rigidity, bradykinesia, and tremor. E. 76 year-old patient with a 6-year history of progressive memory loss, disorientation, and dementia. 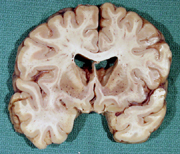 A. Lifelong seizures and fatal intracerebral hemorrhage. Hemorrhagic CSF. 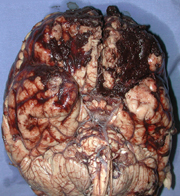 B. Diabetic coma, sinusitis and cerebral infarcts. CSF shows increased cells (polys and lymphs), elevated protein and low glucose. C. Headache, fever, and stiff neck. CSF shows 850 neutrophils, increased protein, and low glucose. D. History of IV drug abuse, low T4 lymphocytes, and dementia. Normal CSF. E. Positive PPD, headache and cranial nerve deficits. CSF shows 89 lymphs, elevated protein and low glucose. Match the case histories to images 66-70. 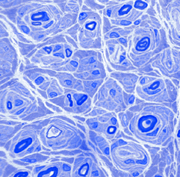 #67 is a thin plastic section of nerve stained with toluidin blue. 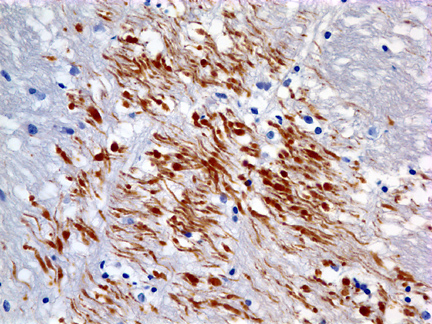 #69 is a section of muscle with a histochemical-ATPase-stain. A boy who was normal from birth through the first year of life, began to walk at 15 months and always had a waddling gait. He was never able to run as well as other children did. By the time he was 3 years old, he could not get up from the floor without pushing on his knees. At age 5, he could not climb stairs and began to walk on his toes. His calf muscles were bulky and felt rubbery. He was a slow learner at kindergarten. Serum CK was 2,735 (normal 3-35). His mother had a CK of 73. A muscle biopsy was done. A maternal uncle died of a similar disease at 15 years of age. A 45-year-old woman had some clumsiness of the right hand for three months. Her elbows, shoulders, knees, and thighs ached. About four weeks following the onset of these symptoms, she began to have difficulty swallowing solid food. She fell easily, could not climb stairs without supporting herself with her hands, and could not get out of a low chair by herself. Sensation was intact. CK was 887 (normal 3-35) and sedimentation rate 42. A muscle biopsy was done. Two weeks after having the flu, this pregnant (first trimester) woman noted tingling of her hands and weakness of the legs. The weakness progressed rapidly and in 9 days she was bedridden, unable to move against gravity or even shut her eyes. Initially, the diagnosis of ‘hysterical reaction” was made, but she developed difficulty breathing, had a tracheostomy, and was put on a respirator. CSF was clear with glucose 81, protein 128, and 1 WBC. She had a cardiac arrest and died four weeks after the onset of her illness. She remained paralyzed until her death. A 15-year-old boy had bilateral high arch feet, weakness and atrophy of the legs and mild weakness of the arms. He had no sensory loss or ataxia. CK was normal. His grandfather, father, and uncle had a similar condition. A baby girl, one of twins, was 2 pounds 11 ounces at birth. During pregnancy, no fetal movement was felt by the mother until the eighth month. As a newborn, she was hypotonic. She developed slowly, and, at six months of age, she was unable to lift her head or roll over. CK was normal. At 12 months, she was extremely weak and hypotonic. Spontaneous movements were apparent only in the hands and arms. Fasciculations of the tongue were noted. Her twin brother and another sibling died of a similar disease. Six other siblings are normal. Match the case histories with Images 71-75. Each image will be projected for one minute. #74 is a myelin stain. A 56-year-old woman developed paranoid ideas and difficulty naming objects. She lost vocabulary, and her speech became repetitive and stereotyped. She appeared anxious. Memory failure developed (though she could remember songs), and dementia set in. She became confused and withdrawn and began to perform ritualistic tasks. She had no seizures or motor deficits. Dementia progressed, and she died in a nursing home 7 years after the onset of her disease. A 62-year-old man had tremor of the hands and head and rhythmic tongue protrusion. He became stiff and walked with small steps in a stooped posture. He was treated with L-dopa and other medications without significant improvement. Four years after the onset of these symptoms, intellectual deterioration and memory loss developed. He died in a nursing home at age 69. A 58-year-old woman had a gradual onset of difficulty walking characterized by staggering, especially when walking in the dark. She had no history of alcoholism and was well nourished. Neurological exam revealed a wide-based gait and abnormal cerebellar testing. While gait difficulty progressed, tremor of the hands and difficulty writing appeared. She had a mask-like face. Treatment with sinemet was without effect. Then, she developed orthostatic hypotension and bladder incontinence. Mental status remained normal. She died 14 years after the onset of her illness. A 70-year-old man developed progressive confusion, difficulty sleeping, and jerks of all limbs. The symptoms worsened and he lost fine motor control of both hands and became ataxic. He became confused and demented. Speech was an incomprehensible jargon. CSF was normal. MRI revealed mild cortical atrophy. EEG was abnormal. He died four months after the onset of his illness. A 63-year-old man developed weakness of the left leg and then of the right leg and both hands. His grip became weak and he began dropping things. Weakness progressed, resulting in frequent falls. His voice changed and he began to drool and had difficulty swallowing. He became bedridden. There were fasciculations of his tongue. Deep tendon reflexes were hyperactive, and plantar responses were extensor. Intelligence and sensation were not affected. He had difficulty breathing and died three years after the onset of his illness.